"You may have​ heard of her before ... They call her the Grim Reaper." Blake is a pretty normal teenage girl - she's got an amazing boyfriend, a funny best friend called Shelby, she is on the cheer-leading squad, and is an adrenaline junky. Things start to change when she turns 18 however, starting with catching the eye of a strange boy in the bleachers, and then with the death of her boyfriend. Blake is suddenly thrown into a world she didn't know, didn't believed, existed. Not only can she see dead people, but they want her to help them cross over. The strange boy in the bleaches turns out to be Rishi, a young death deity, who tries to explain to her that her mother, whom she thought was dead, is alive and wants to meet with her. He fails to mention, however, that her mother is actually pretty well known, at least in some circles; she's the Grim Reaper. As Blake tries to come to terms with the fact that her mother is the Grim Reaper, and her best friend, who dabbles in the occult, is all rather accepting of this news, and that she herself is a death deity, she must travel with Rishi and Shelby to the Underworld, a place where her mother has been banished from, to retrieve the scythe, which is the source of Grim's powers and ability to be able to reap people. To do so they have to sneak into the place where Hades has it, and get back out alive. I enjoyed this book. It was a fun (if not deadly) take on the story of the Grim Reaper, and was full of travel and adventure. The characters were great, and I especially liked Shelby, and how she is connected to the story so much more than some of the other books these days. The best friend had a key role in the story, rather than being someone who was sort of put to one side as new people and characters and drama take over the protagonist's life. I did enjoy the story line, and the explanations given for the things, like how there are different death deity for different parts of the world, and how some of the supernatural things work. I find that sometimes in supernatural/paranormal stories little details are overlooked and you just sort of have to accept them for what they are, and not think about the flaws too much. But I think that Randall did a great job in creating a whole world, rather than just bits and pieces sort of story. While there were parts that were predictable, and moments I got really frustrated with Blake (something that's quite normal for me and main characters), I did really enjoy the story. I think I would have liked to have read more about Grim and have her in more scenes, but it's the beginning of a series, so I suspect she'll be more in the follow book/s. 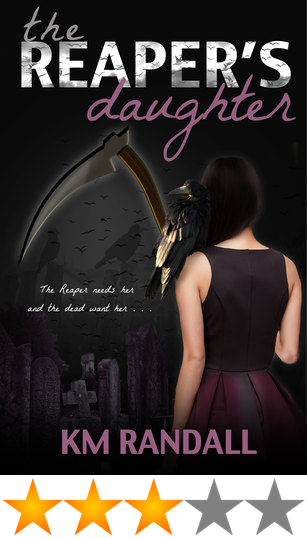 The Reaper's Daughter comes out on May 9th, so if this sounds like your type of book, make sure you grab a copy. Thank you to KM Randall, via Erin Latimer, for providing me with a copy of this book for an honest review.